Taking place for the first time at Wynn Palace in Macau, the six edition of Asia’s 50 Best Restaurants saw the gathering of revered culinary figures from across the continent, of which they waited with bated breath for the new 50 winners of 2018. The list is narrowed down based on a panel consisting more than 300 food critics, chefs and restaurateurs from six geographical regions. These industry players will then select 10 restaurants that they had dined at within the last 18 months, and list them in order of preference. Their votes are finally tabulated to determine the best 50 restaurants. As it turns out, Gaggan Anand’s Bangkok restaurant Gaggan clinched the first spot on the list – a standing the establishment has now remained unbeaten for the fourth time in a row. Coming in hot on the progressive Indian restaurant’s heels are Tokyo restaurants, Den and Florilege that took second and third place respectively. The Singapore pride shone during the awards ceremony with seven local restaurants making the cut. Out of the lot, two-Michelin-starred French restaurant Odette came in fifth place, while Whitegrass, known for its contemporary Australian menu, takes its spot on the list for the very first time. Derived from Chef Julien Royer’s love for his grandmother, Odette likens to an art gallery that spotlights French cuisine. The elegant abode is awash in dreamy pastels, where an ariel installation, created by Singaporean artist Dawn Ng, dangles over the central dining area. 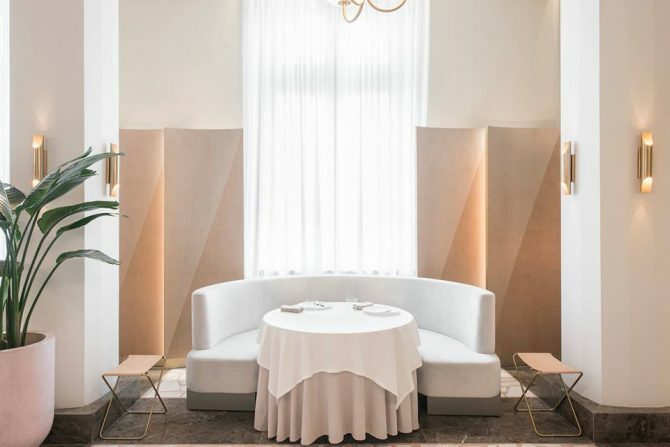 Devoid of an ala carte menu, meals at Odette are in illustrious sets, ranging from four to eight courses or acts, as the restaurant likes to put it. 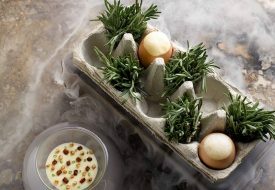 A highlight to look out for is the 55 degrees Pine-Smoked Organic Egg that serves a sous vide egg in its shell, before presented in an egg tray decorated with pine cones. The egg is then slipped out of its shell on a plate that is decorated with truffle shavings, mushrooms and duck pancetta.